Scale: 1: 24. 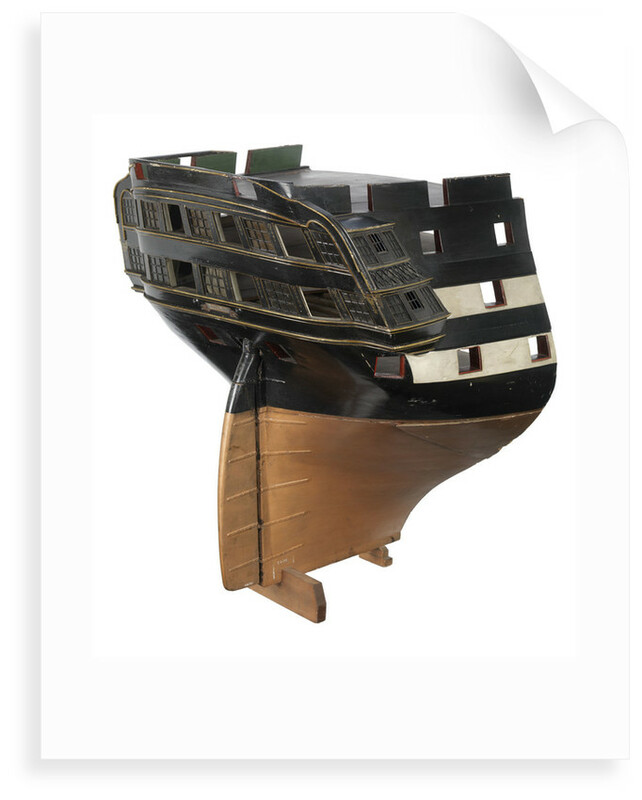 A sectional model depicting elliptical stern of HMS 'Vanguard' (1835), a 3rd rate 80 gun ship. 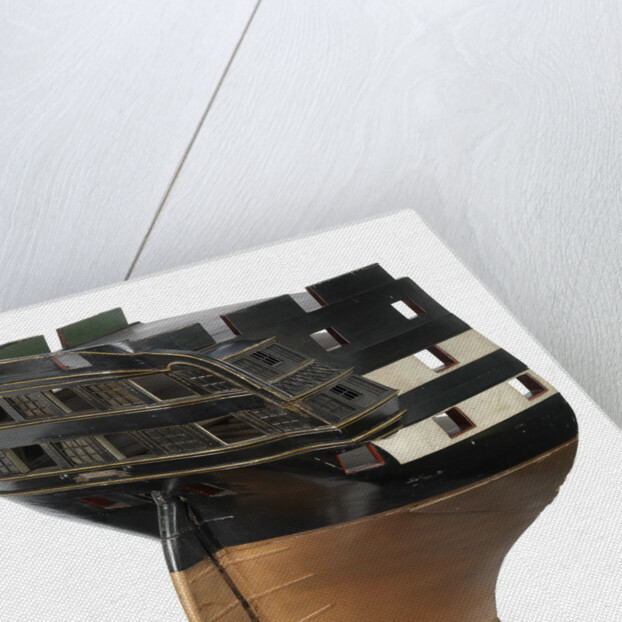 The model is made entirely of wood with the exterior painted black above the waterline and with the traditional two white stripes along the gun decks. Below the waterline the model is painted a metallic copper colour to indicate copper sheaving. The stern and quarter galleries are complete with two tiers of both dummy and glazed windows, some of which double up as gun ports. There is a solid taffrail and bulwark surround the poop deck whilst on the lower counter just above the round-headed working rudder is painted paper name board inscribed with "Vanguard". 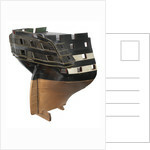 The whole model is mounted on a large wooden keel crutch at the extreme end of the deadwood, and a small wooden keel block at the fore end of the keel. Internally the model is complete with three planked decks supported by deck beams on beam shelves below and waterways above. 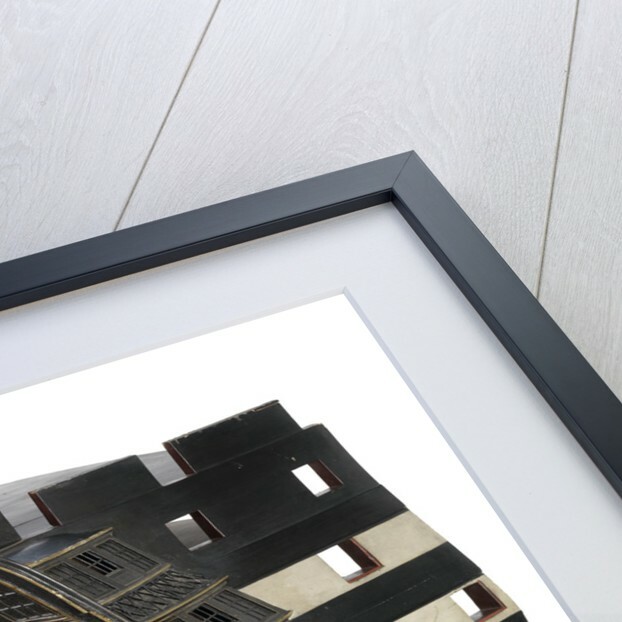 The planking is finished in a brown-yellow colour, with the underside and deck beams painted white. The lower gun deck is fitted to the solid section of the lower half. 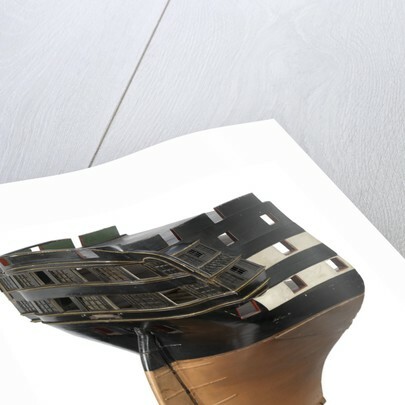 The inboard faces of the bulwarks on the poop deck are painted a blue-green with black capping. All the gun ports included in the model are painted red internally. There is a small paper label applied to the poop deck, but which has later been painted over.